Thanks everyone for sharing you thoughts on what to do in our laundry room. I got some really great advice and have some ideas brewing in my head. You are the best! 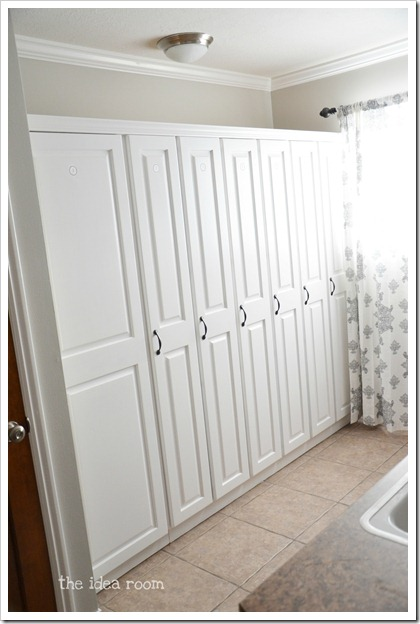 Are you getting sick of me posting about my Laundry Room? 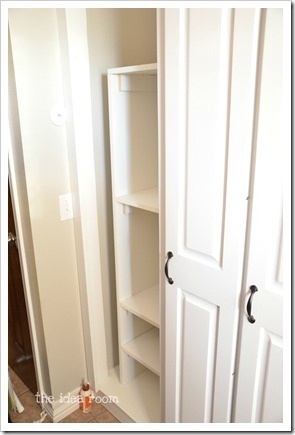 I hope not because today I am going to share with you how to build a closet shelf…or in our case a shelf in the larger locker we were able to create from a side panel. This locker was just empty inside and so even though we could store some things in there, it was not very organized or efficient. There was a lot of wasted space. So we decided to build a few shelves in there. The estimated cost for us was about $35. We needed our shelf to be 5 feet tall and about 17.5 inches wide to fit into our space. You will need to determine the size that will work for your space. 1. 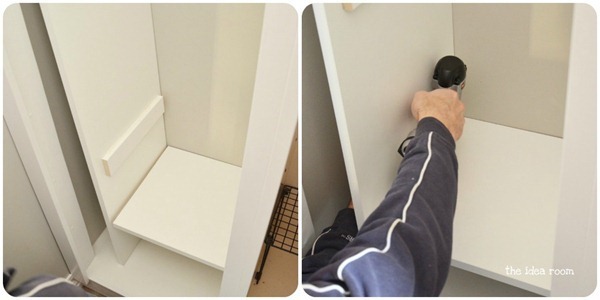 Measure and mark the locations of where you would like your shelves to be located in your closet or space. Be sure to take into account the thickness of your shelves. Our melamine board were 3/4 inch thick so we made sure to lower the side support down 3/4 of an inch so the shelf would sit exactly at the height we wanted it to be. 2. Use your circular saw (not pictured) and cut your side supports. We cut our tall side boards (vertical) 5 feet. The side supports were cut to 13.5 inches. And the shelves were cut to 16 inches. The top shelf was 17.5 inches as we attached it to the tops of both of the side pieces. We also added some side supports under the top shelf to give it more stability and support. 3. Originally we were going to add an additional support along the back of the shelf, so we added some spacing on the back of the support to allow for that…but ended up not doing so. You can just run your support sides all the way to the back of the side panel if you don’t plan of the back supports. 4. Glue your side supports into place and then add a couple of well placed nails to secure the wood so it can dry and get a good seal. We secured the right side panel by drilling screws into the other side of the locker. 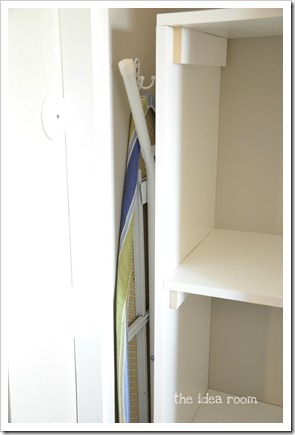 We did not place our shelf across the full width of the closet as we wanted to leave a small space to store our ironing board. 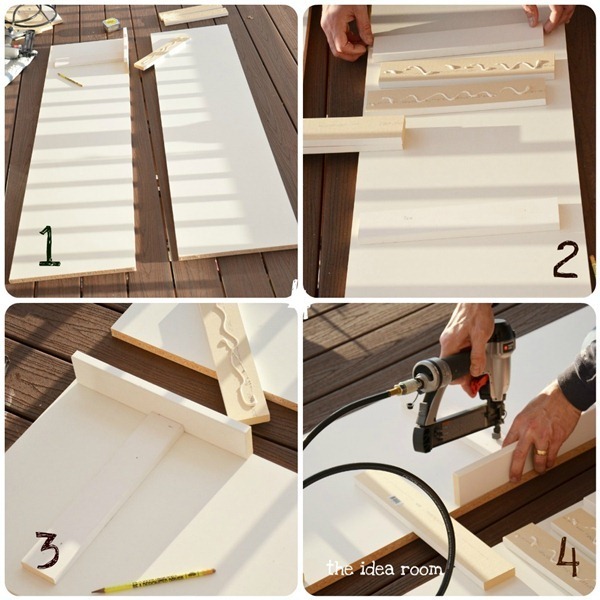 Now screw your shelves into place with a thin line of wood glue and a couple of well placed finishing nails. That’s it! Now we have some more storage space. I actually use this as MY personal storage area. It is now a great place to store my shoes and my church and gym bags, etc. It is so nice to have them all in one spot now. Some of you asked about what we actually store in the other lockers…There are seven lockers…one for each person in our family. 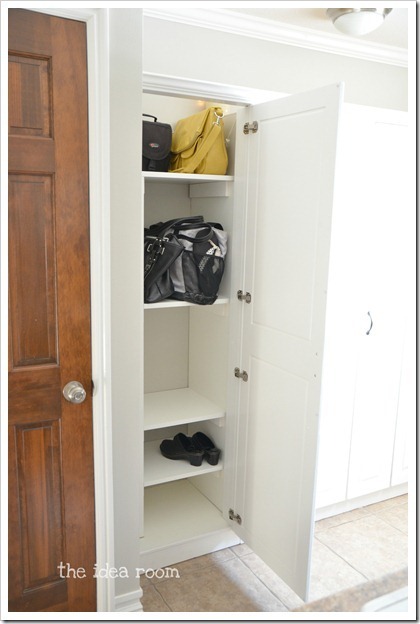 Each person has their own locker to store their coats, some shoes, hats, gloves, etc. Items that they need to grab as they are headed out the door. They aren’t always pretty inside…ha ha…but with the doors shut, no one is the wiser. I loved my locker in high school. What fun it would be to have one as a grown up! I love that you have one for each member of the family. You could make some chalkboard name plates for each door and it would tie in the other black cabinets. Ummm…I might have nightmares frequently about not remembering my locker combination. It is horrible! I would LOVE a locker without one! And PS…shelves kinda make me giddier than they should. These look ah-maz-ing! I’m pretty much moving in to your house after the remodel. Get ready!